Our core expertise is providing end-to-end analytics solutions. 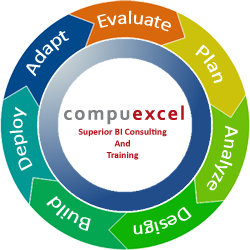 We offer a full range of services to help your organization implement analytics solutions. Our analytics application development services use our proven methodology for developing applications. Evaluate: Establish current state of analytics/data environment, and existing enterprise infrastructure. Plan: Create BI strategy, establish analytics Centre of Excellence, define enterprise infrastructure to support vision and identify and plan a specific project. Analyze: Perform detailed analysis to create detailed business requirements for the identified project. Design: Design the BI solution, including database design, metadata repository design, ETL design, and front end design. Build: ETL development, metadata repository development, and front-end application development. Deploy: Implement BI solution, provide knowledge transfer and training, provide post-implementation support. Adapt: Measure the effectiveness of the solution, identify new needs as the solution is adopted, identify new projects.